I recently worked on a project that used SlowCheetah (XML Transforms) and Octopus variable substitution to modify the custom Sitecore include files. It proved difficult to determine what the Sitecore configuration was in each environment, especially for the content delivery servers, as it was not possible to call showconfig.aspx. Each time the application starts, it writes out the contents of the merged Sitecore configuration to a file in the logs folder. The file name contains the instance name, date and time created. So in addition to seeing the current configuration, you can also see how it changes over time (very useful after a deploy where nothing works). Create a processor for the initialize pipeline, so each time Sitecore is started the processor will be called to ensure that the configuration is saved. Create a public class with a public member called Process, which accepts a parameter of type PipelineArgs. The code below is all that is needed. The processor has to be added to the initialize pipeline, I would recommend you create an include file to achieve this, but for the sake of clarity I have added it directly to the web.config, see below. Now every-time Sitecore is started it writes out the configuration, so it is easy to get the configuration and monitor how it changes for all environments over time. I hope this helps you untangle the Sitecore includes which at times can be a nightmare. 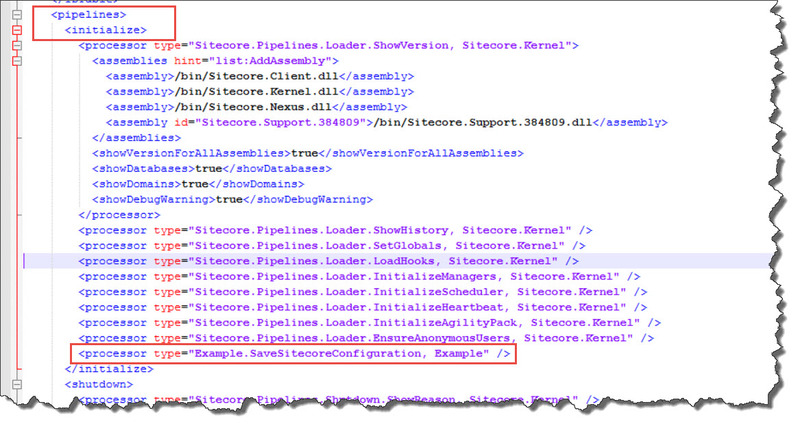 This entry was posted in Pipeline, Sitecore and tagged Pipelines, Sitecore, sitecore includes on March 15, 2016 by Alan Coates. You can take these configs and then use Sitecore Config Builder (https://marketplace.sitecore.net/modules/sitecore_configbuilder.aspx) to create the merged config file. Also I would like to log how the sitecore configuration is with all the includes applied to the web.config not just a copy of them.